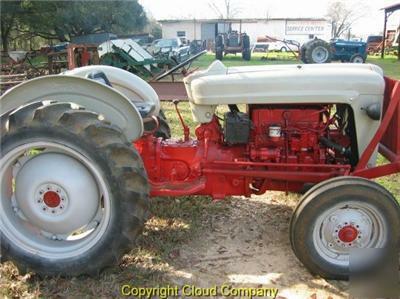 Ford 800 Tractor - Restored - Check It Out! Look the pictures over and if you have any questions please give Al Gibson a Call. He is located in South West Georgia, and that is where this tractor is also located. You will find his phone number further down in the contacts sections of this listing. Cloud Company is a Broker of Farm and Construction Equipment. So, if you have some equipment you want to sell or if you are looking for a specific piece of equipment to purchase - Give us a call. It doesn't cost you anything for either service! Any time you have a question or concern, do not hesitate to contact us.Â We prefer email because it gives us a chance to research your answer more thoroughly.Â Sometimes we will be unfamiliar withÂ a specific product and will have to go look at the equipment orÂ refer you to the manufacturer's website. You may email us at . All freight claims must be settled before a refund is given. We do not accept personal checks.Â They will be returned to you if you try to pay with one.